American Roller Bearing will replace or repair (at our evaluation), any goods which fail in normal use and service due to defects in material or workmanship free of charge for one year after the date of receipt. Such goods must be returned to American Roller Bearing at its Morganton, North Carolina manufacturing facility, transportation charges prepaid. No return shipments will be accepted without prior written authorization of American Roller Bearing. American Roller Bearing’s obligations with respect to such replacement or repair shall not include costs of transportation, installation, adjustment or other expenses which may arise in connection with such replacement or repair. The provisions of this warranty shall not apply to any goods which have not been properly lubricated, subjected to misuse, improper storage conditions, damage due to negligence or accident, or which shall have been repaired or altered in any way so as, in the judgment of American Roller Bearing, to affect adversely their performance and reliability, nor which are used for a purpose for which they are not designed. 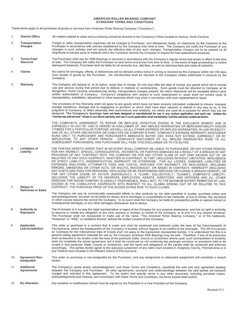 AMERICAN ROLLER BEARING’S AGREEMENT TO REPAIR OR REPLACE DEFECTIVE GOODS IS THE EXCLUSIVE REMEDY AND IS EXPRESSLY IN LIEU OF, AND IS HEREBY IN DISCLAIMER OF, ANY IMPLIED WARRANTIES OF MERCHANTABILITY AND/OR FITNESS FOR A PARTICULAR PURPOSE, AS WELL AS ALL OTHER EXPRESS OR IMPLIED WARRANTIES, IN LAW OR EQUITY, AND OF ALL OTHER OBLIGATIONS OR LIABILITIES ON AMERICAN ROLLER BEARINGS’S PART. AMERICAN ROLLER BEARINGS’S EXPRESS WARRANTY HEREUNDER RUNS ONLY TO THE PURCHASER AND PURCHASER’S IMMEDIATE BUYER AND DOES NOT EXTEND, EXPRESSLY OR BY IMPLICATION, TO ANY OTHER PERSON. AMERICAN ROLLER BEARING’S DISCLAIMER OF ALL IMPLIED WARRANTIES RUNS TO ALL SUBSEQUENT PURCHASERS AND USERS, AND PURCHASER WILL PASS THIS DISCLAIMER ON TO ITS BUYER. IN NO EVENT SHALL AMERICAN ROLLER BEARING BE LIABLE FOR INCIDENTAL OR CONSEQUENTIAL DAMAGES TO PURCHASER, IMMEDIATE OR REMOTE BUYERS, AND IN NO EVENT MAY THE COMPANY’S LIABILITY EXCEED THE PURCHASE PRICE OF THE PRODUCT.